I'll make this quick. The hardest part about the National Championship game last night was that there's no new lesson to glean from it. When you take penalties, you're going to have a hard time winning. When you can't get the puck into the opponent's zone, you're going to have a hard time winning. When you can't get a change in overtime, it's going to be almost impossible to win. In the long run, maybe it's a lesson about rising expectations. When Michigan won the West Regional, I did not see how, realistically, Michigan could beat North Dakota. I hoped they would, I put together scenarios on how they could, but I just could not see it. But, after 60 minutes of panic and fear, Michigan was one game away from being national champions. I saw all of the old ghosts, the shutout in the national semi-final, wearing the maize jerseys, all of those things, and presumed that fate was going to intervene, especially when it was 2-2 going to overtime. But, alas, it was not to be. So let's sum up in the best way we can. Hats off to Minnesota-Duluth, a worthy champion. Hats off to Red, for being Red, my favorite coach ever. Hats off to this senior class, because you were probably the most fun group of seniors since the 1997 senior class. Hats off the the Children of Yost, for being the best student section in any sport anywhere in America. 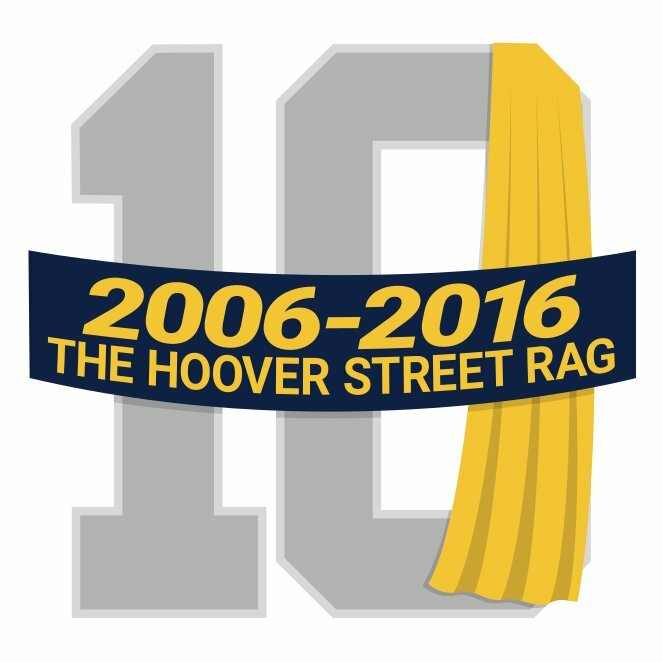 Hats off to the Michigan Hockey blogger community, for being passionate, articulate, and an awesome read throughout the season. Hats off to the Michigan Daily's hockey coverage, one of the absolute best groups of writers I have ever read. Hats off to Geoff for driving us to cover Hockey Christmas once more in the way we knew we could. Hats off to all of you for being a part of Hockey Christmas. Last and certainly not least, Next Year in Tampa Bay. It's only a few hours before the puck drops on Michigan's first appearance in the national championship game since 1998, and I find myself totally incapable of coming up with anything that's worth reading. If you want a preview, go over to Yost Built, MichiganHockey.net, mgoblog, or a few other places. Even the preview I wrote in 45 minutes three weeks ago might be worth it. I saw my first Michigan hockey game in 1993. I was 12, and my family went to see the very first College Hockey Showcase at the Palace of Auburn Hills. Almost by mistake I stumbled on the '96 and '98 national title games in overtime, and in between I went to Day 1 of the '97 GLI. But I can pinpoint the moment that everything changed for me: January 29, 2000. My friend Sara was a huge Mike Comrie fan, and for her birthday party we all went down and got standing room tickets at Yost. We climbed up and up into the rafters in the north end zone. The game was against Ohio State, and there was a t-shirt giveaway. I wore it for the UNO game just a couple weeks ago. The game was one of those classic ones where the better team takes a ton of shots, but can't get many quality chances. Michigan's Sean Peach scored early, but OSU got one back in the 3rd, and that's how it ended. But not for me. I think that's how it starts for a lot of Michigan hockey obsessives – You see a game at Yost, and you want more of that. By next season, I was traveling to the CCHA Super Six, and skipping out of a UAC meeting early to watch Michigan die like Vikings against Minnesota in the Frozen Four. I've never witnessed this moment for Michigan hockey. I've watched three championships in person – '05, '08, and '10 – and none of them featured Michigan. It's been 13 years since Michigan last made it to this point. I remember the exit in '01 to BC and Brian Gionta (the OG of magic midgets), the furious comeback against Minnesota in '02 that wasn't enough, that horrible thing in '03 to Minnesota where you thought they might just might do the thing but Thomas Vanek is soul-killingly good at hockey. In '04 it was BC again, when scoring chances just seemed to melt away and whistles ceased to exist for vast stretches of the game until it was Ben Eaves connecting on a mid-air rebound and it was over, then in '05 Al Montoya and the rest of the team imploded and let a 3-goal lead to CC evaporate. '06 was a NoDak bludgeoning; '07 was a NoDak bludgeoning where a frustrated TJ Hensick said the magic words and somehow Eric Ehn is walking out of there with his Hobey Baker. I was there in '08 sitting right in front of Brian when Billy Sauer let in a couple soft goals, and one of my favorite Michigan teams ever just ran out of gas in an overtime loss. '09 was Volkening stealing one for Air Force. '10 was Waterloo, Indiana. And even this year: What are the chances we win that game against UNO if the review goes the other way? My point is this: The best team doesn't always make it this far, the best team doesn't always win, but Michigan has made it this far and they have that chance. And it's almost hard to believe that it exists. I hope they take it. Sometimes that happens. It's a product of the tournament, it's a product of the sport, it's a product of the fact that you are capable of spectacular things every once in a while. Shawn Hunwick flat out robbed North Dakota on any number of high quality chances, and even giving up 40 shots the defense didn't hang him out to dry. Ben Winnett had 3 goals coming, 4 coming out, and that was all that was necessary tonight. Michigan held a team that was averaging 5.88 goals per game in the last month to ZERO goals in this game, including something like five power play opportunities. It was by far their best performance of the year on the biggest stage against the baddest opponent. We hope they kept something in the tank for Saturday against Duluth, but tonight we can revel in our victory over a despised foe. As Craig said on Twitter, "My Michigan brethren, I want to hug all of you." Go Blue. I don't have any idea what's going to happen. Michigan's not a favorite, obviously, but not a prohibitive underdog. They don't have the same glaring weaknesses as the last couple of times they've faced NoDak, but they aren't really better than them at anything. If the game goes like it should on paper, North Dakota wins 5-3 with an ENG. But a 3-2 Michigan win isn't an insane prediction either.